The Crater Foundation would like to honor Francie Patterson as a retired educator that spent 27 years in School District 6. Francie is another outstanding educator that has made a difference in many young people’s lives. After Francie retired and her husband Dennis retired from the Medford Fire Department, they moved to Sunriver, Oregon where they built a house. Francie quickly became involved in the Sunriver community volunteering at the 3 Rivers Elementary School for seven years, participating in local 10k and half-marathons, making quilts for local community outreach programs, serving as a Smart Reader Volunteer and doing school library work, working on the annual weed pull in Sunriver and organizing the Sunriver Quilt Shows. She has performed in a Rock ‘n Roll band for five years in Sunriver and is their costume maker/seamstress. They entertain the summer visitors to Sunriver with 50s and 60s music. She explains, “It’s an air band, no musical talent required!”. 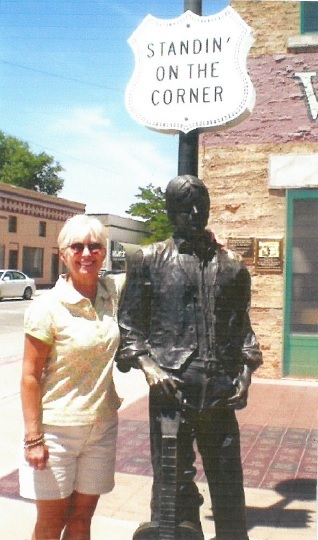 Francie and Dennis also find time to travel a lot throughout the U. S. as well as abroad. She also spends time in Eugene with her grandkids. Francie was another valued professional and the District is very proud to have had her as a teacher in School District #6.